House wrap is another step in the process of preventing moisture and air intrusion into your home. It is fairly inexpensive, and easy to install, so there is no reason not to use house wrap on your home during your do it yourself siding project. 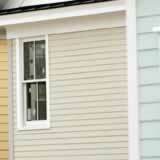 House wrap should be installed after your old siding has been removed. Inspect your exterior sheathing prior to installing the house wrap, all holes in your sheathing should be patched with new sheathing. Smaller holes or tears can be taped, but your house wrap should be going over a solid surface in all areas. Cut out all window and door openings, and tape the house wrap over the flanges or up to the frame. Upper pieces of house wrap should always overlap the lower pieces. Caulk or tape the house wrap around all utility connection penetrations. You are now ready to start your do it yourself siding project. While you are installing siding, double check all taped joints, and take care not to tear the house wrap.